For Coptic Pope, see Pope John XI of Alexandria. Pope John XI (Latin: Ioannes XI; 910 – December 935) was Pope from March 931 (at the age of 20) to his death in December 935. The paternity of John XI is still a matter of dispute. His mother was certainly Marozia, the most powerful woman in Rome. According to Liutprand of Cremona (Antapodosis, ii. c. 48) and the "Liber Pontificalis," his father was Pope Sergius III (904–911), ("Johannes, natione Romanus ex patre Sergio papa," "Liber Pont." ed. Duchesne, II, 243). 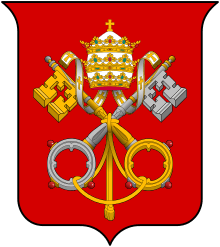 Ferdinand Gregorovius, Ernst Dümmler, Thomas Greenwood (Cathedra Petri: A Political History of the great Latin Patriarchate), Philip Schaff, and Rudolf Baxmann agree with Liutprand that Pope Sergius III fathered Pope John XI. If that is true, John XI would be the only known illegitimate son of a Pope to have become Pope himself. (Silverius was the legitimate son of Pope Hormisdas). On the other hand, Horace Kinder Mann, Reginald L. Poole, Peter Llewelyn (Rome in the Dark Ages), Karl Josef von Hefele, August Friedrich Gfrörer, Ludovico Antonio Muratori, and Francis Patrick Kenrick maintain that Pope John XI was sired by Alberic I of Spoleto, Count of Tusculum. 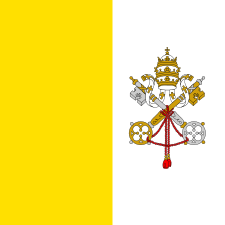 His mother Marozia was the de facto Roman ruler at the time, resulting in his appointment to the Papacy. 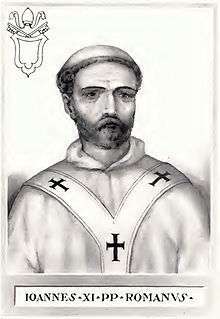 Marozia was thus allegedly able to exert complete control over the Pope. At the overthrow of Marozia around 932, John XI reportedly became subject to the control of Alberic II, his younger brother. The only control left to the Pope was the exercise of his purely spiritual duties. All other jurisdiction was exercised through Alberic II. This was not only the case in secular, but also in ecclesiastical affairs. It was at the insistence of Alberic II that the pallium was given to Theophylactus, Patriarch of Constantinople (935), and also to Artold, Archbishop of Reims (933). It was John XI who sat in the Chair of Peter during what some traditional Catholic sources consider its deepest humiliation, but it was also he who granted many privileges to the Congregation of Cluny, which was later on a powerful agent of Church reform. ↑ George L. Williams, Papal Genealogy: The Families and Descendants of the Popes, (McFarland & Company Inc., 1998), 15. ↑ Baxmann, Rudolf (1869), Die Politik der Päpste von Gregor I. bis Gregor VII, II, Elberfeld, pp. 58–125. ↑ Poole, Reginald L. (1917), "Benedict IX and Gregory VI", Proceedings of the British Academy, 8: 230. Herbermann, Charles, ed. (1913). 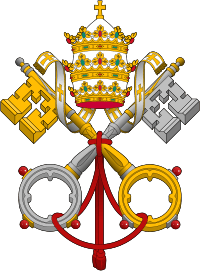 "Pope John XI". Catholic Encyclopedia. New York: Robert Appleton Company.